Find out how and when to send us internally and externally assessed marks and coursework and controlled assessment. Art and Design. NEA component 1 – portfolio (all options), Microsoft Word file, PDF file. NEA component 2 – externally-set assignment (all options), Microsoft Word file, PDF file. Business Subjects and Economics. Unit 3, Microsoft Word file, PDF file. Unit 4, Microsoft Word file, PDF file. Unit 5, Microsoft Word file, PDF file. Read about how we standardise coursework and controlled assessment marks. Find deadlines for submitting controlled assessment or coursework to AQA. This is mine from last year, it got 74/80 UMS so I guess it's as good a place to start as any if you're feeling daunted. 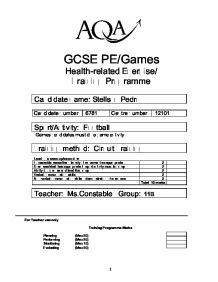 Edit: Apparently on the teaching resources section of the AQA website (you need a login) there are examples of past projects. I found two from my old college's Moodle: This one got an A, and this one got a C.